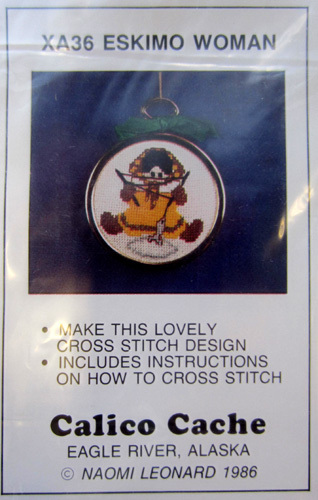 Do you remember how excited you were when you received a craft kit as a kid? Did a smile spread across your face? Did your eyes try to take in every detail of the package and the goodies inside? Did it take every ounce of willpower you had not to jump right into this new craft project to the exclusion of everything and everyone around you? What did you get? That was me at Christmas and my birthday…a spring coiled tightly and waiting to explode with creativity after all gifts were opened and everyone left or busied themselves with their own gifts. 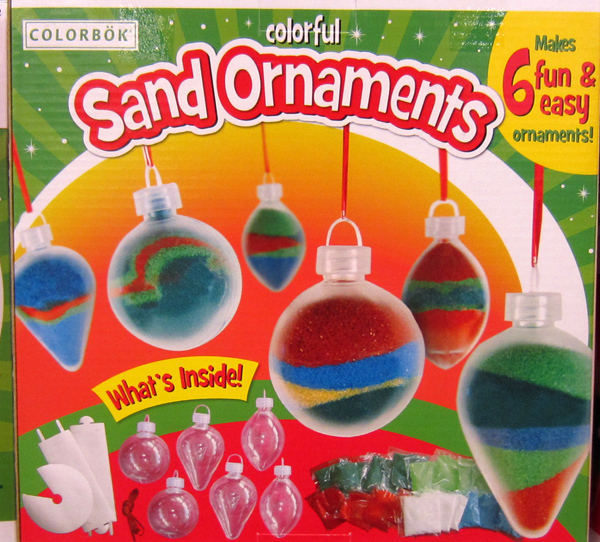 This box brought back memories of the Sand Art projects I did as a kid. As I walked around the store what also came flooding back from the deep recesses of my memory was the frustration I encountered doing the first couple projects. I kept at it though and soon became quite good, though not an expert by any means. As I walked past the aisles and aisles (and MORE aisles) of Christmas everything that was beckoning to me, my memory changed from frustration to the excitement I mentioned above. I’m sure that feeling was very evident because of the hugeness of my smile, my twinkling eyes and the spring in my step. I may have even giggled a bit. Christmas is just around the corner and even if you or I aren’t the recipients of that crafting gift, we can give it to others and watch them light up just like we did! 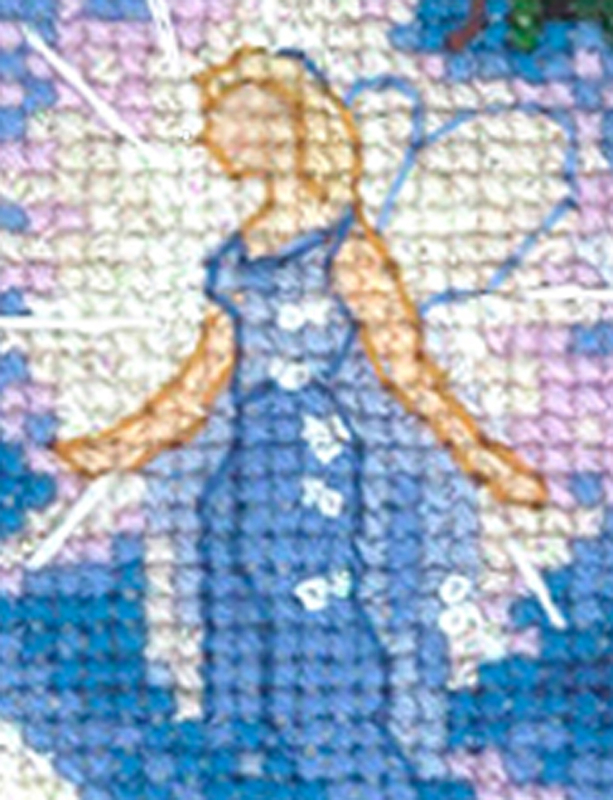 MCG Textiles has the PERFECT small kits for your young crafters…or the older generation who like to craft but whose eyesight no longer allows them to work on projects with tiny details. The first line is EZ Yarn Art. There are 6 different designs that fit perfectly in an 8″ x 10″ frame when they’re done. Included in the kit are a pre-printed and pre-slotted foam board, acrylic yarn, the tool and easy-to-follow instructions. You can see the entire line and the video demonstration if you click here. 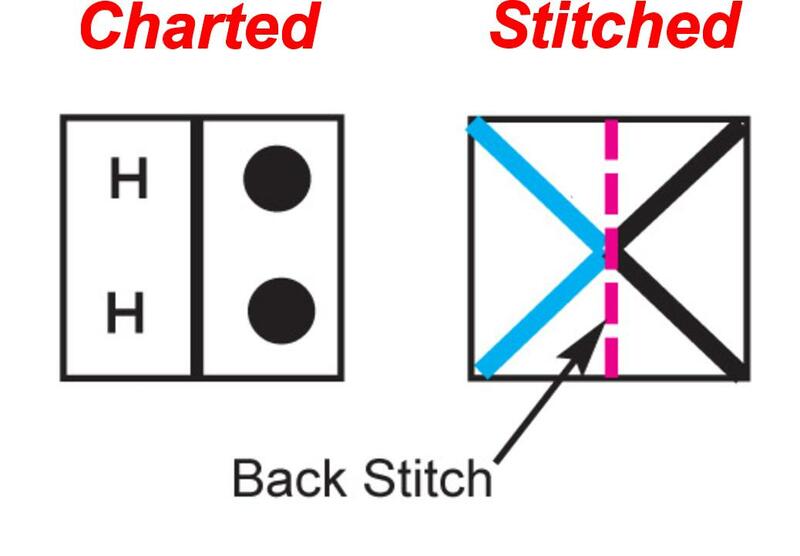 The next line is the EZ Stitchin’ Line. 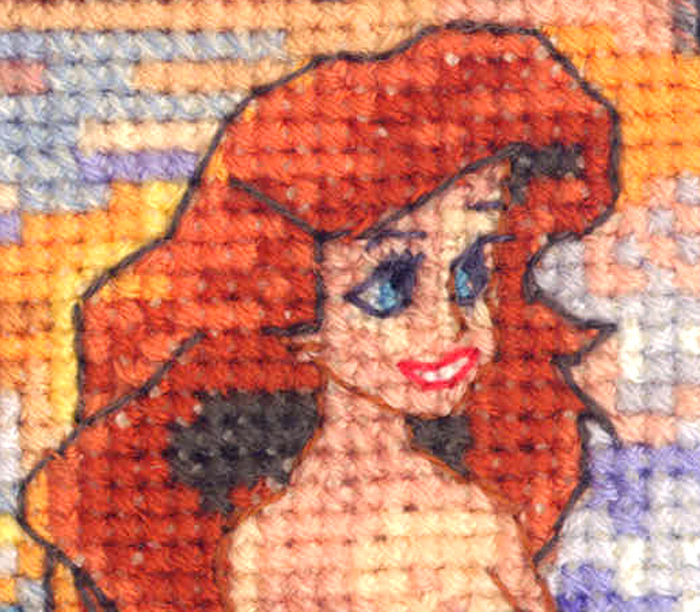 These six 5″ x 7″ designs are cross stitched on 5-mesh canvas. The designs are colorful and fun…and perfect for both older and younger crafters! 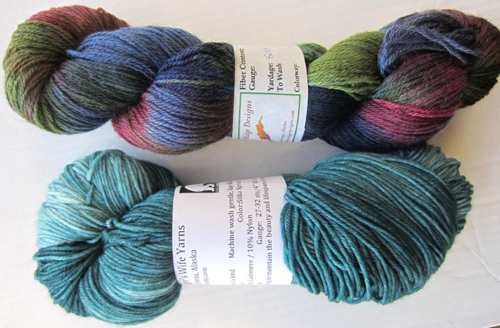 The kits include canvas, acrylic yarn, plastic needle, chart and easy-to-follow instructions. Click here to see the fabulous designs! The last line is the Beginnin’ Stitchin’ Line. This line offers ten 5″ x 7″ designs that will appeal to boys and girls, young and old. 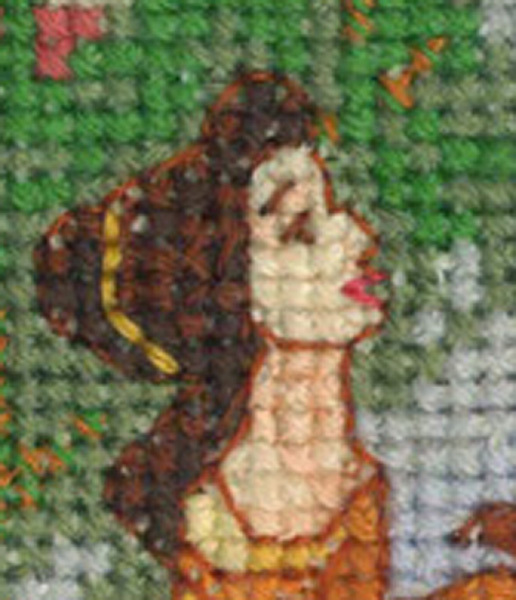 The fabric included is 6-count Aida but instead of full cross stitches you do half cross stitches – kind of like needlepoint on cross stitch fabric. Each kit contains fabric, acrylic yarn, plastic needle, frame (the same color as pictured), chart and easy-to-follow instructions. Are you in the shopping mood? Well click here to see the designs included in this line! Are you looking forward to getting someone excited about crafting this holiday season? Who will it be and with what craft/kit? Be sure to let us know! If you’re making a locker hooking rug, place mat or other project with finished edges, them I’m sure you’re following the instructions and folding the canvas under on all sides and hooking through all layers at the same time. 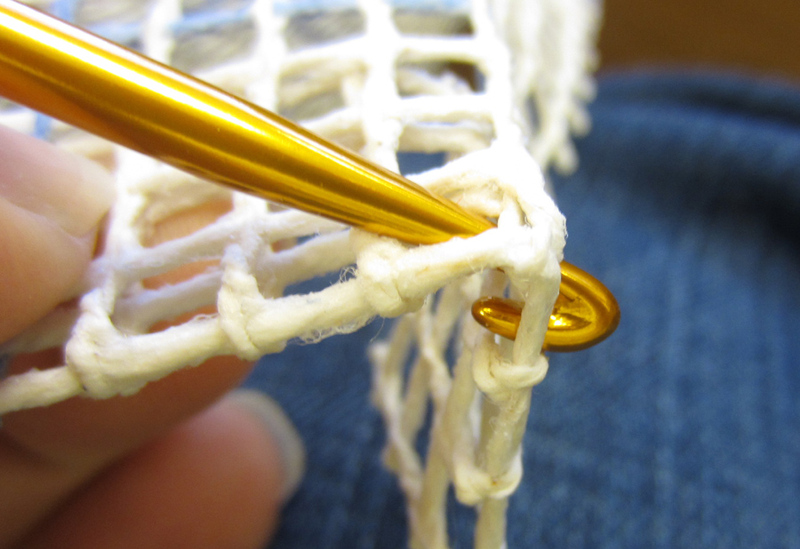 If you are, I’m pretty confident that, like me, you’ve encountered some struggles when it comes to the corners because you’re hooking through FOUR layers of canvas. No matter how carefully I fold back the canvas edges, the four layers never line up well for those 9 corner squares. Since I love locker hooking and I hate struggling with anything, I spent some time experimenting with resolutions to the corner problem and have come up with one that works for me. It makes the hooking project so much easier that I thought I’d share it with you! Note: I’m right handed so I work right to left. If you’re left handed and work left to right, please substitute “left” for “right” in all the directions below. First, fold three rows to the back along all four sides of your canvas. 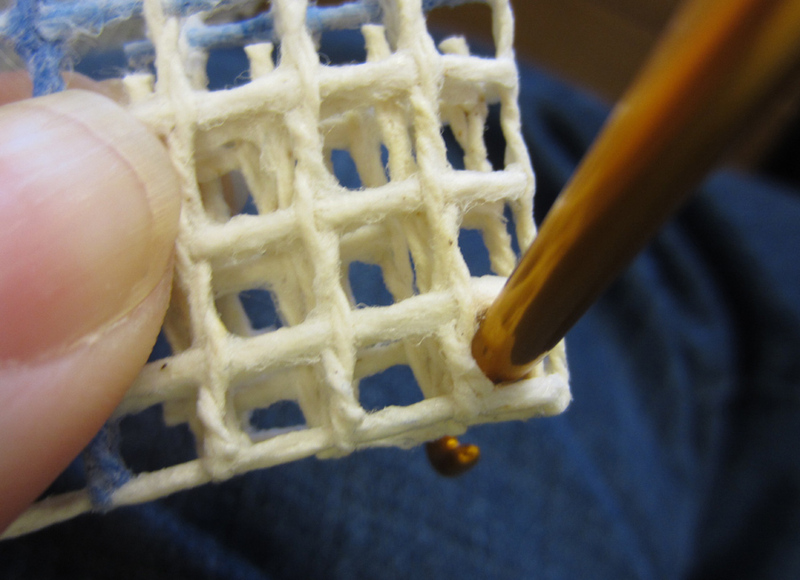 As you do this you’ll notice that two opposing sides fold easily (twisted canvas threads) and two are a bit more difficult to fold nicely so the holes line up (parallel canvas threads). I consider hooking through the corners a two-stage process. Stage 1 is the easy-to-fold sides and stage 2 is the more difficult to fold sides. Bearing that in mind, let’s do Stage 1. Grab your canvas so an easily folded side is on the right and a not so easily folded side is on the bottom. 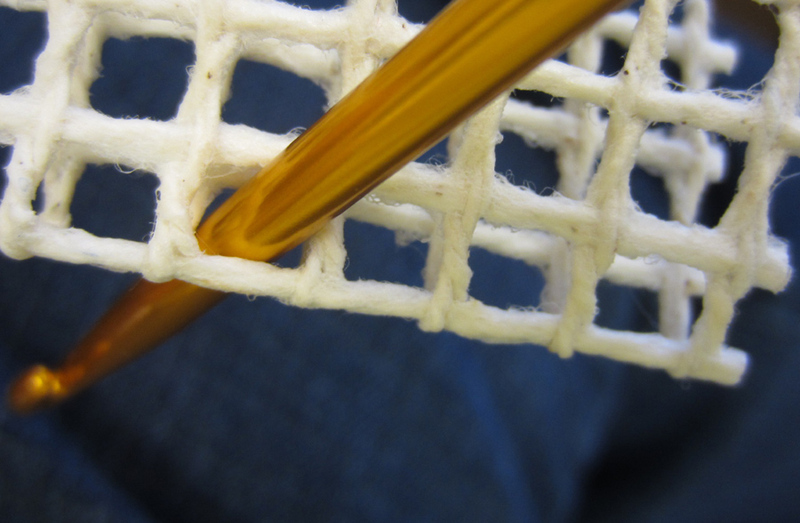 With only the bottom side folded, count in from the unfolded right edge and place the tip of your locker hook tool through both layers of the 4th square. The 3 empty squares are the turn under for the right edge. Now on to Stage 2. Gradually fold the right edge towards the center of the canvas. 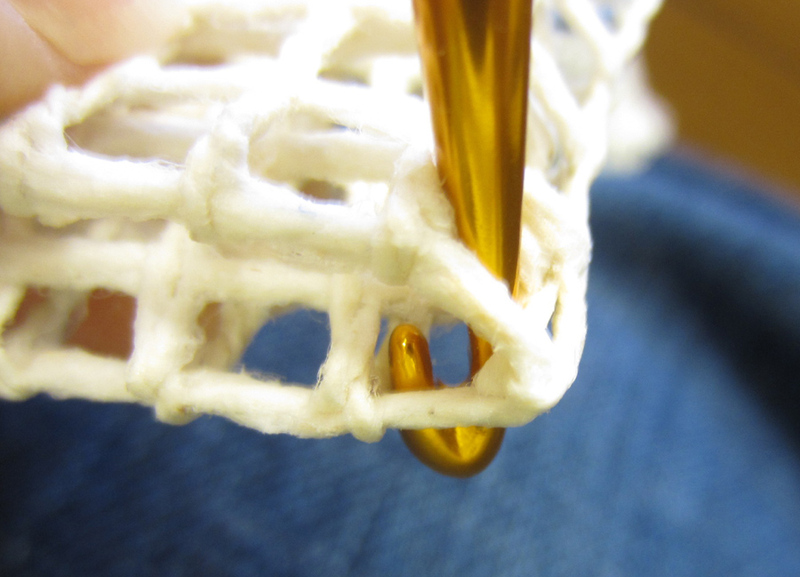 Your locker hook tool should angle to the right until the tip finds the square immediately to the right of where it first went into the canvas. As you push the locker hook tool through that square, the lightweight aluminum tool is doing all the hard work for you and lining up the four layers of canvas! The great news is that it’s not just the first square that gets lined up, but all 9 squares where the canvas is quadrupled! Now that the holes are lined up perfectly your corners will be a breeze! 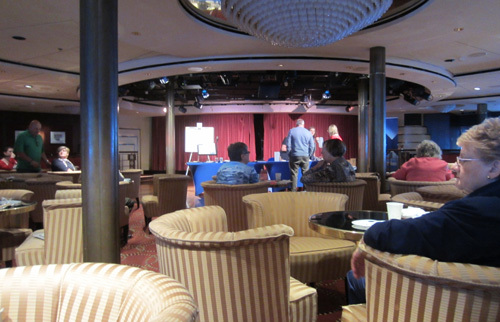 I tried my very best to get a couple of posts written before I headed off on vacation, but it just wasn’t meant to be. Between getting all my work commitments done, prepping for kitty care/house sitter and just getting myself packed, it’s been a couple of weeks of non-stop chaos. The good news is that I’ve hit that pre-vacation point where I’ve decided that if I haven’t packed it or I haven’t done it then it’s just too bad. Where am I going? Well, I’ll tell you when I get back. If you’re also on vacation and see a gal crafting away, stop by and say “hi” – it might just be me!!! I will let you know that I’m embarking on 11 days of new experiences…half of which will be doing nothing (a TOTALLY new experience) while the balance will be full of fresh air and awesome new adventures. Lest you think I’ll be totally removed from the crafting world, one of my preparations was Googling craft shops in the places I’ll be. Here’s hoping I find something totally new and wonderful to explore and share! This brings me to a question for all of you. When you go on vacation, does your crafting self stay at home or are you constantly on the look-out for craft shops or people who are crafting in public? And do you pack a project or two between your clothes? My answers are yes and yes…but what about you? I’ll be anxious to see what you have to say when I get back! Many friends say I have a major crafting flaw – I prefer to think of it as an obsession Somehow that seems less negative and more adventurous. So, what is this obsession? Because I love crafting and filling my house with my finished projects, I have a tendency to go a bit overboard with the size of some of them. I don’t necessarily mean the finished size, but rather the amount of work and time involved in the project. Here’s an example…and this time finished size DOES count! My kitchen, dining area and family room are all one big room in my house. The kitchen is easily separated from the other two areas thanks to a breakfast bar and linoleum flooring. The dining area and family room areas have the same flooring (off-white carpet) but different color walls. Even though the walls are different colors, the two areas still felt connected so I started looking for a rug to put under the table and chairs. During the unsuccessful hunt my creative subconscious went into overdrive and when it was ready to burst, it kicked the project idea into my conscience. Once I became aware of it, I jumped on the idea with all the excitement I could muster. I’m going to MAKE the 8′ x 10′ rug! I’ll locker hook it! 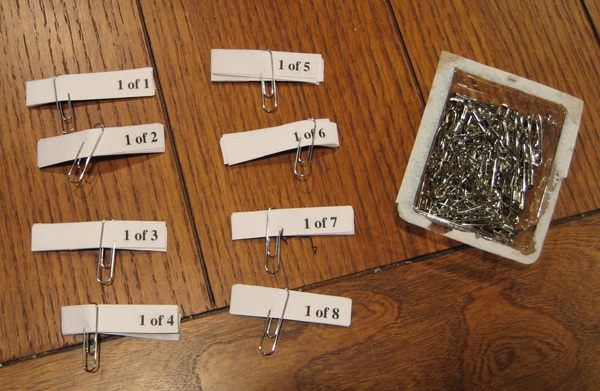 As creative as I am, I’m also very logical, two opposing traits that can make for some interesting crafting. The good news is that once the logical part is over, the creative part is fun! 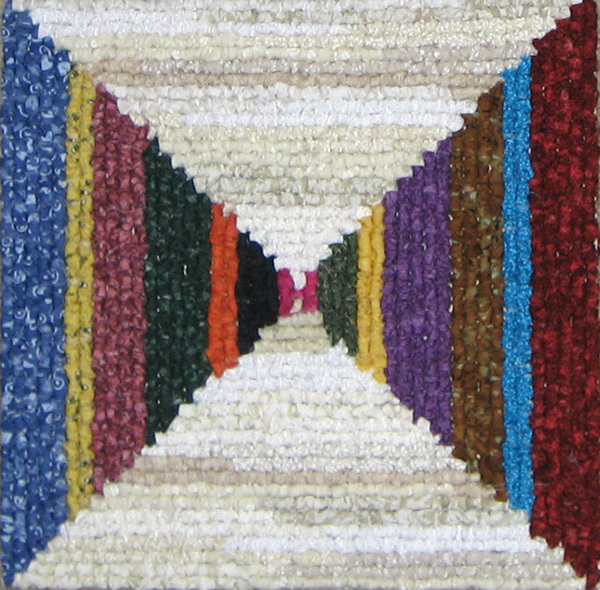 For this project, the logical me decided that I should make the rug in 12″ x 12″ squares then whip stitch them together at the end. The project would then be small and portable! Great idea, right? If you’re good at math, you’ve already figured out that this great idea meant I needed to hook 80, yes, EIGHT ZERO, squares! Fortunately the quantity didn’t deter me. Instead I looked at it as a challenge, and one I would definitely win! I designed a simple pattern that would be repeated on every square. 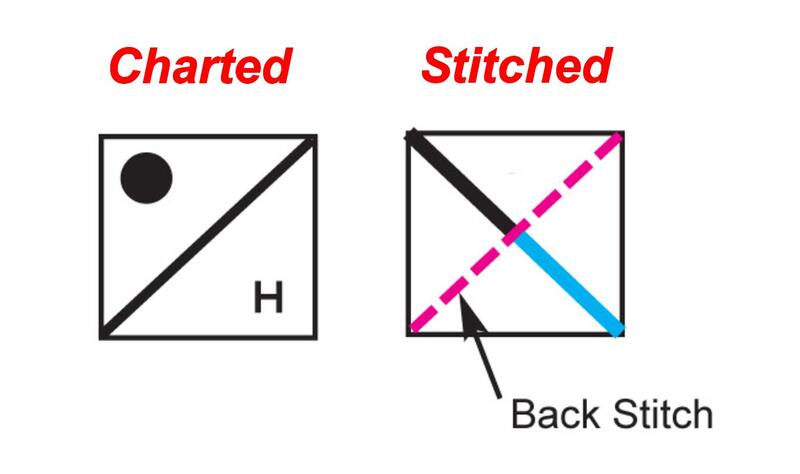 Two opposite triangles would be a variety of white/off-white fabrics and the other 2 triangles would have multi-colored stripes To keep the variety and color factor high, no two stripes in the same square would use the same color…and no two squares would be identical. I shopped at MCG’s website to buy 54″ x 60″ packages of 3.75 mesh canvas, and I became a regular visitor at my local Joann’s store, especially when their fabric was on sale. 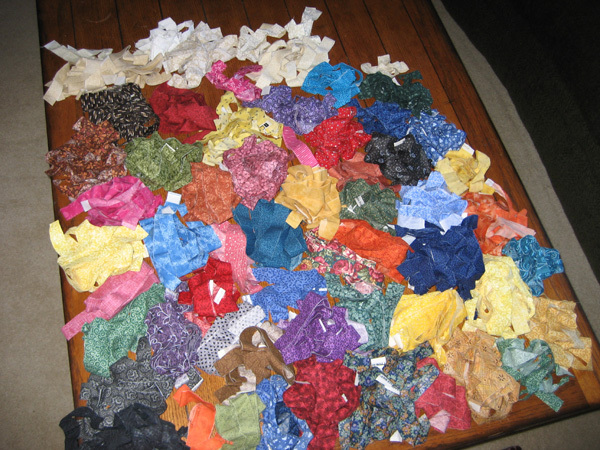 I would cut my fabric into strips right away and use one strip to tie all of the same colors together. As big as this project was, I did need to keep myself somewhat organized 🙂 At some point during this project, this is what my strip covered coffee table looked like. 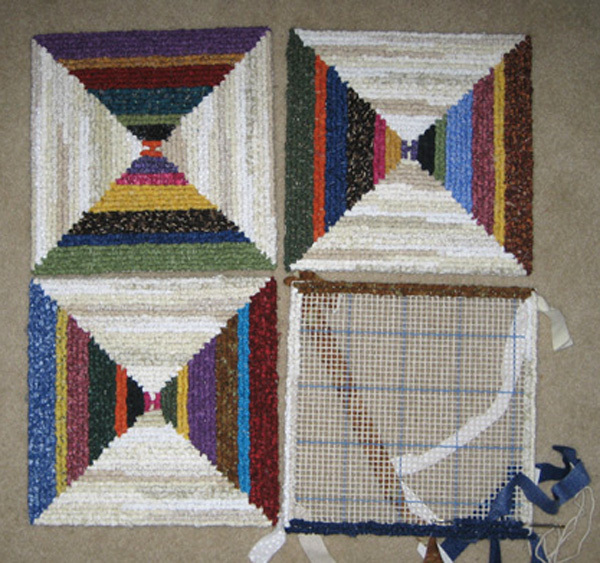 Once I had 3 squares hooked and the 4th started, I laid them out just to get an idea of how the finished project would look. As I progressed along the way, I was able to complete one square in about 4 hours…if I was completely focused. I took squares with me everywhere, including auto shop waiting rooms, airports, craft nights with friends, vacations and anywhere else I thought I’d have some time to fill. I didn’t work on this rug every spare moment because there were other commitments, but finally, after about 15 months, my stack of 80 squares was complete! Now came the truly fun part….putting it all together! I backed my vehicle out of my 2-car garage, laid out a huge piece of plastic then spread out all the squares in a controlled chaos sort of way. It took me about 3 hours to arrange them the way I wanted them, making sure that no two stripes of the same fabric or fabric color touched each other. Since I had no intention of tying up my garage during the assembly process, I spent an additional hour or so labeling each square so I could put the rug together the way I wanted it. 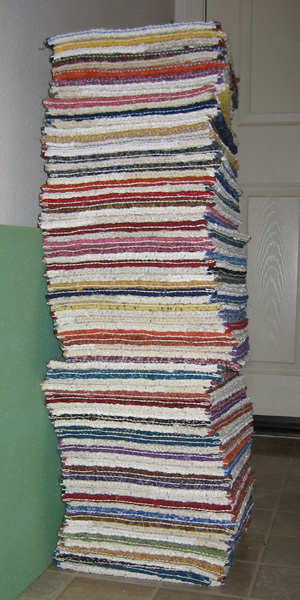 I whip stitched each row and stacked them in my dining area. 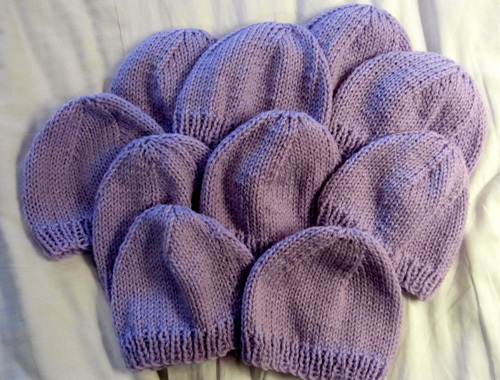 Here are 6 completed rows…and supervisor Scarpetto. When all 8 rows were done I whip stitched the rows together in pairs, then the 4 pairs were whip stitched together into 2 sets of 4. At this point I spread the plastic out in the garage again and laid down the 8 rows. I used one full can of Scotch guard on each set of 4 rows in hopes that should the kitties gift the rug with a furball or two, or a guest decorate the rug with some red wine or spaghetti sauce, I’d be able to get the majority of the stain out. 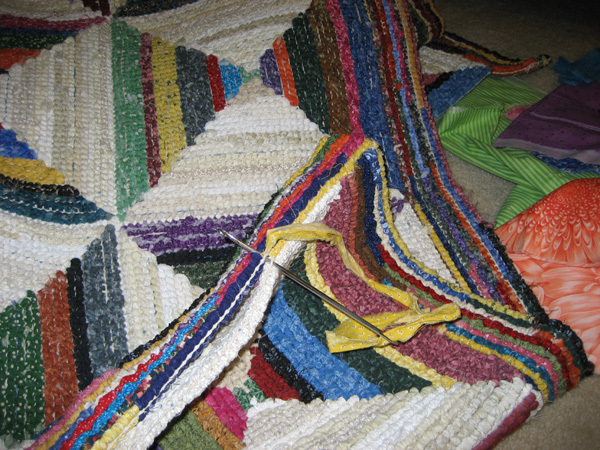 After the two sections dried I whip stitched them together then spread out the rug. I didn’t like how the off-white triangles looked against the off-white rug. The colored ones looked great because they really popped against the carpet, but the off-white ones were, well, icky! 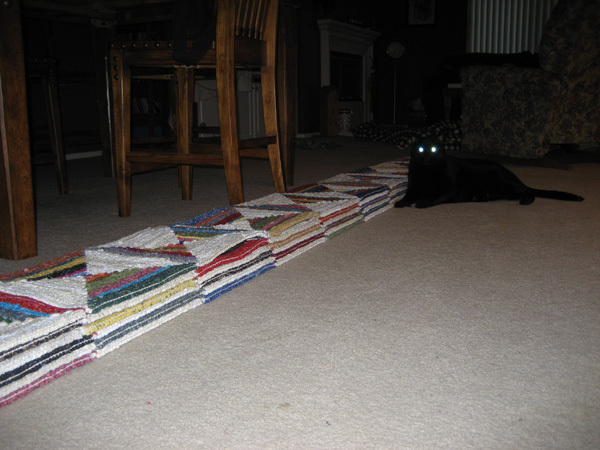 I still had many fabric strips left so I decided to make a 3″ border for the outside of the rug. 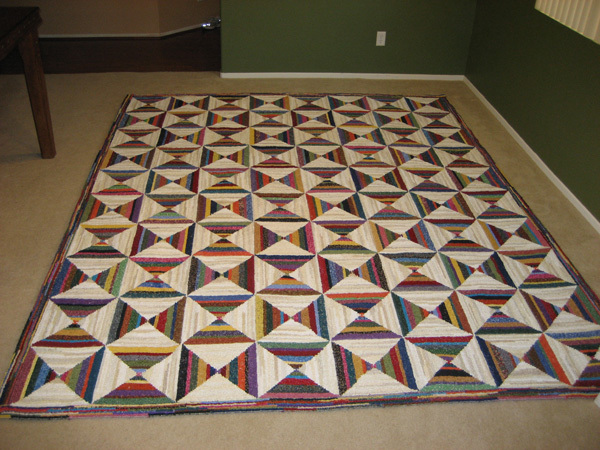 I would hook it in strips and attach it to the sides in a log cabin quilt sort of way. I cut the canvas to size and hooked the 4 border sides using just the colored fabrics. The finished rug was rolled up and laying against the wall, but as I started each border side, I unrolled the rug to make sure I didn’t use a fabric color that would touch the same color edge of the square. Finally the day arrived that I was whip stitching the final border side in place!!!! 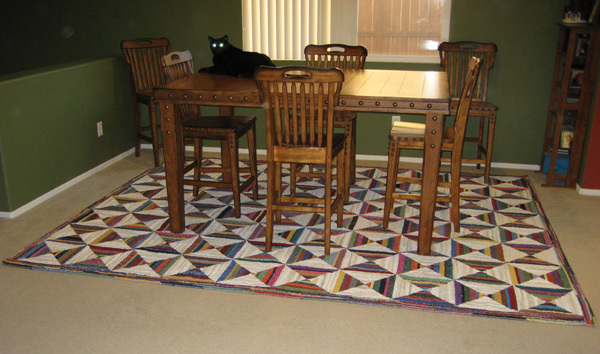 I couldn’t wait to finish it and spread out the final rug….which now had a finished size of 8-1/2′ x 10-1/2′. And now with the pub-height table and chairs on top of it…and guard-kitty Scarpetto on top of the table. 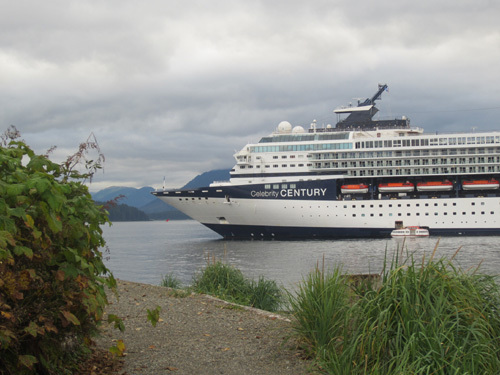 So folks…I’ve shared my “going overboard” project…time to share yours!!! 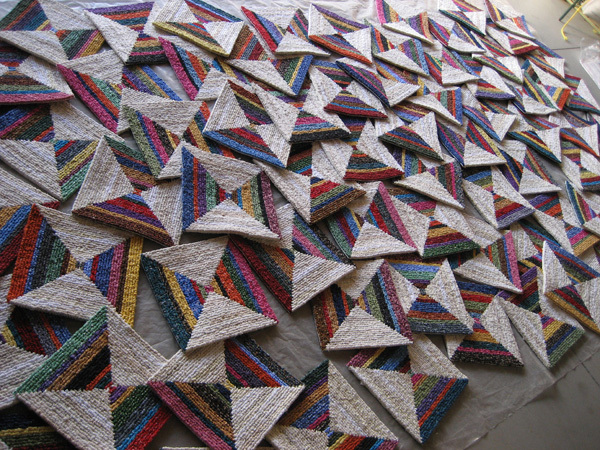 What’s the biggest or most intricate project you’ve done? The one that has people scratching their heads and thinking you’re a bit nuts? I had planned to write an off-topic post, to fill you in on my Ravellenics knitting project that ruled my life for a couple of weeks, but instead a force of nature has temporarily put it on a back burner. And that force of nature can be summed up in one word…. My heart has been breaking for all of MCG Textiles’ fans that are in, or know someone who is in, Isaac’s path. When I look around my home I see countless treasures that my friends and family painstakingly made for me, or that I made for myself. First and foremost is protecting life, but if there is time, how does one decide what treasures are more important than others? I absolutely positively do not know how I would decide, except to say that the ones made from my hands would be less important, as I could replace them, but those made from the loving hands of others would be first into my evacuation vehicle. Am I naive? Would I really grab the treasures of others? I don’t know for sure, but I do know that I live in an earthquake zone and I have a “grab ‘n go” bag in case of evacuation. on top of that bag is a list of times to grab if I have time. It’s broken down my room and I update it every year. Amazingly, after grabbing my kitties, my “grab n go” bag (food, important docs, first aid kit, change of clothes, personal care items, flashlight, water, etc), my laptop, my camera, family photos, a rug I locker hooked for my dining room and the paintings I have from my Mom, the rest of the items are more of a survival nature than an emotional nature. Which is why I made the initial list and annually update it during a non-emotional time, and why I keep that list on the top of my “grab ‘n go” bag. Should I ever need it, I need to be able to focus on the necessary rather than letting the heart rule. All of that being said, if you my fellow crafters, were ever faced with an evacuation scenario, what would you grab? Would you take any crafting supplies or projects that you completed? Or would you focus on hand-made gifts from others? Would you be sure to pack survival supplies first or family photos? Before you answer, think about a time limit of as little as a 1 hour before a mandatory evacuation that comes with minimal warning…then think about it with a 1 hour mandatory evacuation that follows a 3 hour warning. Then think about what is really important to your survival, heart and soul. And do this when the chance of an emergency evacuation is so remote that those around you laugh at the time and energy you are expending. Would you bring any craft supplies/projects….what would they be…who made them? And why would you choose them? Let me know!